Almost a year and a half after the birth of 15-M, its slogans, demonstrations, and debates have made a deep mark on Spanish society. In fact, they have achieved the two main premises that, according to Gramsci, help turn a mere economic or structural crisis to turn into a systemic or organic one. First, the collapse of the intellectual theses of the ruling class. And second, a transition in the political activity of the masses from total passivity to some form of active engagement. So yes, the old is dying—but what about the new? Is there anything beyond frustration and despair? Where are the positive slogans, the alternatives? Is it true, as Gramsci said, that they cannot yet be born? Since the outbreak of the crisis in 2008, Spanish society has been battered by a barrage of financial, political, and psychological assaults. Unemployment has skyrocketed, workers’ rights have been eroded, and education, healthcare and social programs have been cut beyond recognition. Except for the most well-to-do, no sector of society has been spared. For most, indifference is no longer an option. But the widespread frustration has not always been productive. It has fueled new political parties such as UPyD (Unión Progreso y Democracia), founded by a leading figure of the Socialist Party, whose main distinction from the traditional ruling parties is its insistence on reducing the number of political posts and limiting politicians’ privileges. To be sure, ideas like these channel voters’ frustrations and their rampant hatred of the political class. But in practice, UPyD draws support from those sectors of the population that don’t see any real alternative to the present system—sectors that do not trust alternatives or are afraid of change, clinging desperately to the memories of life before the crisis hit. They are wrong, of course. There are alternatives. And it is more important than ever before to make them visible. Only showing what is possible will help spark the excitement and creativity necessary to mobilize a depressed civil society. Only showing what is possible will help people to accept new ways of looking at the world now that their previous world has crumbled. The old is dying, in other words, but the new is being born. Alternative ways of political and economic organization are indeed spreading, slowly but surely reaching every segment of Spanish society. Of course, many of these alternatives are not, strictly speaking, new at all. 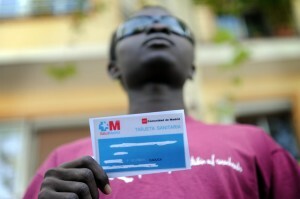 Some are new to Spain; others did exist but are now growing exponentially. In both cases, however, the alternatives offer the promise of building something new after the tremendous social and political destruction generated by the global crisis. What follows are just some these alternatives; there are many more. 1. Time banks. As of February 2012 there were nearly 300 “time banks” registered in neighborhoods and towns all over Spain, as shown on this map. Time banks are a network for the exchange of services. They are based on the simple principle of “pay it forward”: instead of customers’ money, the banks keep track of hours “invested,” using software created especially for this purpose. Therefore, anyone who has contributed a task or skill—cooking a particular dish; repairing an electrical plug; processing tax returns or giving classes of Japanese—can receive any service offered by someone else registered for the number of hours they have in their account. This elegant mechanism helps strengthen communities, forging new bonds of solidarity and mutual support—but it also provides services to those who cannot pay for them, while valuing people for what they do rather than for what they have. In this way, time banks provide a real alternative to the capitalist system of service exchange. Urban garden at Forat de la Vergonya. Photo Enric Senabre. CC BY-SA 2.0. 2. Consumption groups and urban gardens. Just in Madrid’s region there are more than 50 grupos de consumo (consumption groups). Linking consumers directly with producers, their objective is to avoid middle men, providing all kind of high-quality, local, and mostly organic products (vegetables, bread, cereals, meat, eggs, beer, etc.) at reasonable prices. They also aim to create a close relationship of mutual trust between consumer and farmer. In the 1970s, many people wanted become organic farmers but there was no market for their products. Now the situation is reversed, and the demand is such that consumers sometimes have trouble finding farmers. Urban gardens are another alternative for people who want to know where their food comes from. 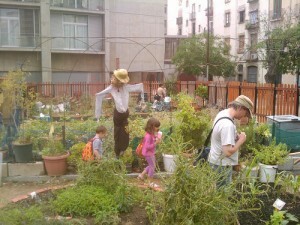 Recently, more than 20 urban gardens have been established in Madrid, making productive use of wasted urban spaces, building community and, in passing, making a political statement by highlighting the defects of urban planning. Urban gardens and grupos de consumo both allow citizens to gain a margin of freedom from corporations and the other powers that be in one of their most basic needs: food. 3. Eco-villages and city-to-countryside migration. While consumption groups are mainly urban, so- called ecoaldeas or eco-villages develop in rural spaces—abandoned old towns or rural real estate—where groups of people join together to build a sustainable existence, respectful of nature and one another. The Red Ibérica de Ecoaldeas is frequently updated with new projects all over the country. Traditionally, rural communities welcomed people tired from urban life and committed to simplicity and organic living. However, nowadays ecoaldeas are becoming also an alternative for people who either have lost or cannot find a way of life due to unemployment. Incidentally, the ecoaldeas are just one part of a much larger pattern of migration from city to country, which has an increasing impact on rural communities. The urban newcomers often bring an innovative and entrepreneurial spirit and have the energy to undertake new social initiatives. Especially since emergence of 15-M, these initiatives are increasingly political, aimed at changing traditional power structures. 4. Ethical Banking. 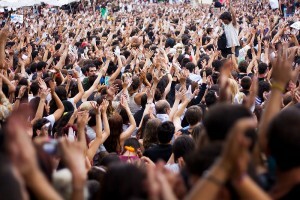 After all the disasters wrought by the speculative economy, so-called ethical banks is growing very popular very fast. Also known as social, alternative, civic, or sustainable banks, ethical banks are centrally concerned with the social and environmental impacts of their investments and loans. Championing transparency and accountability, they only invest in social, environmental or cultural projects in the real economy. Savings deposits in ethical banks have increased in Spain by 1,760% since 2005, and loans by 1,150%. Just in 2011, they grew by 54%. The most important and famous ethical bank is Triodos, with 61,000 customers in Spain, but there are others, like Fiare, Coop57 y Oikocredit. One of the two spokespeople of Equo, Juan López de Uralde. 5. Political parties. The collapse of the Socialist Party (PSOE) and the fast decline in the polls of the ruling conservative party (Partido Popular, PP) have created room for political alternatives. Small traditional parties, seeing their chance at gaining political relevance, have begun to join forces. The populist UPyD, already mentioned, was born in 2007. But the left is making moves too. 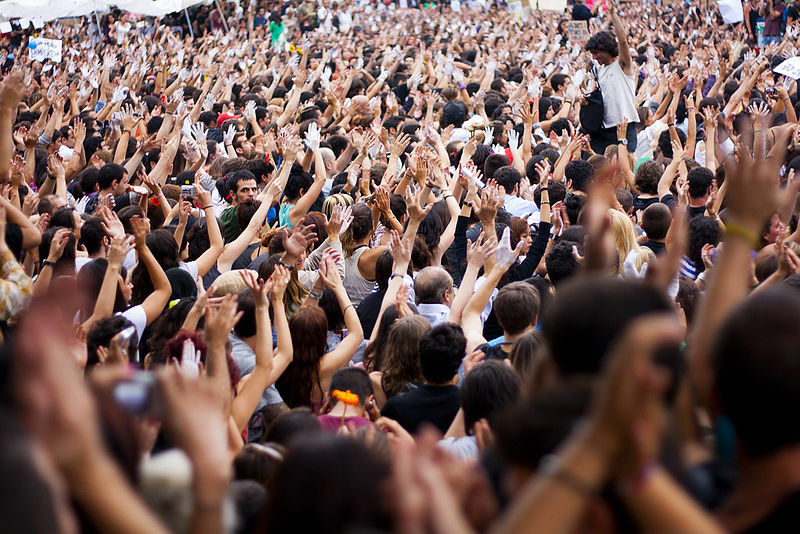 A large group green parties has decided to join together in Equo, combining traditional ecologist ideas with an emphasis on citizen participation, transparency and creating alternatives to the crisis through the development of the energy sector. In regional politics—which are key, given Spain’s semi-federalist structure—there have been some very recent changes in the face of the upcoming October elections in Galicia and Basque Country. 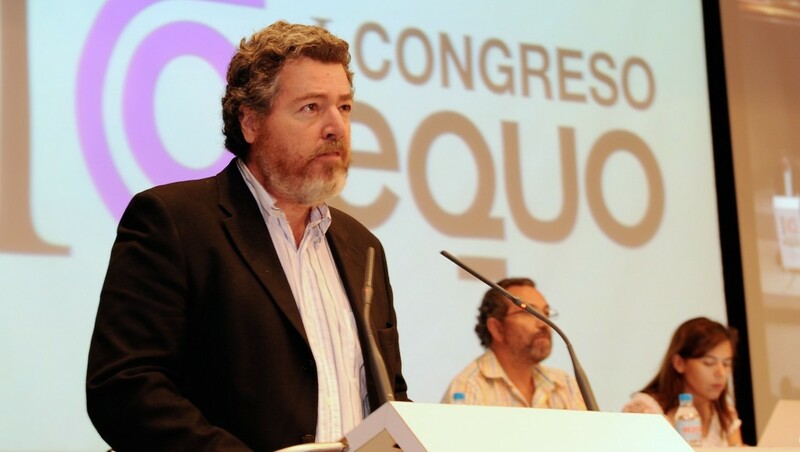 Galicia has seen the appearance of the so called “Galician Syriza” (in reference to the Greek party of that name): a new coalition hoping to forge a progressive front of nationalist and non-nationalist parties. The renunciation of violence by ETA, the militant organization fighting for Basque independence, has given rise to Bildu, a large coalition of parties from the pro-Basque “izquierda abertzale” or nationalist left. Finally, the most leftist wing of the United Left (Izquierda Unida) is drawing increasing attention, due to the popularity of the young national deputy and brilliant economist Alberto Garzón, and the headline-grabbing actions of Juan Manuel Sánchez Gordillo, regional delegate in Andalusia, better known as the Spanish Robin Hood. Along with his farmers’ trade union, the Sindicato de Andaluz de Trabajadores, Sánchez Gordillo has organized massive occupations of unused farm land. He has also led farm laborers into supermarkets to expropriate basic living supplies, as a way to draw attention the Spain’s increasing poverty. An immigrant protesting healthcare cuts. Photo Fernando Sánchez. 6. Actions in support of immigrants. Early on, the 15-M movement organized “brigadas vecinales” or neighborhood brigades to protect illegal immigrants from illicit police raids—an initiative that helped expose these raids to the general public and eventually forced the government to commit to ending the practice. Later, 15-M helped reveal the appalling conditions in the so-called Centros de Internamiento de Extranjeros, internment centers for foreigners: prisons for immigrants awaiting for deportation. Again, the government was forced to allow NGO oversight. Finally, a few weeks ago, a group of 100 doctors created a civil disobedience platform, committing to keep serving illegal immigrants in spite of the recent government measure excluding them from Spain’s universal healthcare system. 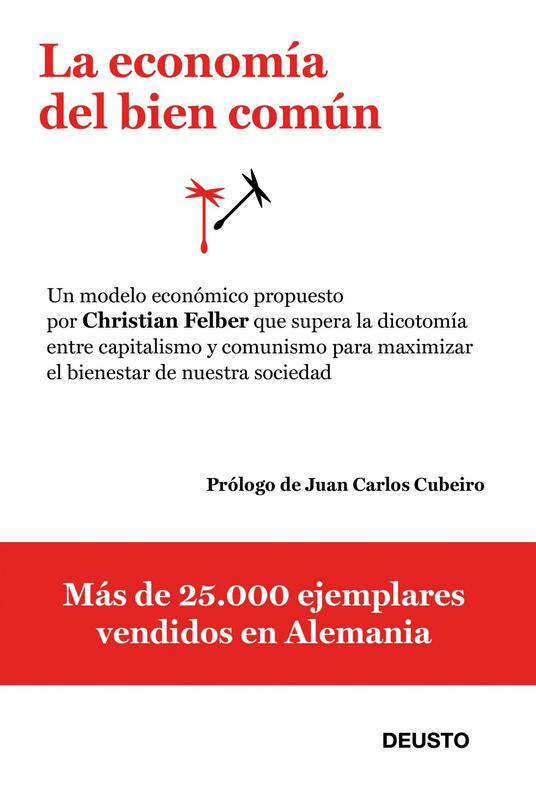 Felber, The Economy of the Public Good. 7. New proposals for alternative economic models. Hundreds of heterodox economists, long marginalized at their universities, have joined in initiatives such as EconoNuestra (Econo-Us or Econo-Ours). A number of seminal texts have become very popular in Spain, including the collection Hay Alternativas by Juan Torres, Vicenç Navarro, and Alberto Garzón, which is distributed for free through the internet (pdf). 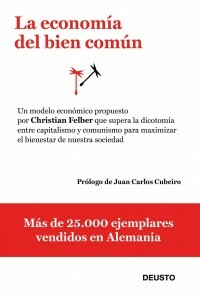 Another frequently cited title is Christian Felber’s La economía del bien común (The Economy of the Common Good). Felber combines psychology and economy to imagine a model in which capitalism is turned upside down without turning the economy into a state-controlled one. Felber’s model is already being put into practice by hundreds of organizations and companies in several European countries. Furthermore, the idea of “decrecimiento” or reverse economic growth is gaining strength thanks to the rise of civil groups and the support of the long-standing organizations such as Ecologistas en Acción. 8. Media. Since the Spanish media is overwhelmingly dominated by a handful of conglomerates, plurality is not its strong suit. After the demise of the progressive newspaper Público this past spring (see Berta del Río’s story in this issue), the offerings at a mainstream newsstand don’t go beyond four right-leaning newspapers and one centrist one. State-owned public television has been turned into a propaganda mouthpiece of the ruling Partido Popular. Meanwhile, the one progressive network is struggling for financial survival. However, there is hope. From the ashes of Público new projects are arising. These include a strong cooperative generalist paper (MásPúblico); a new opinion venue for the leading voices of the intellectual and political left (ElDiario.es) and other alternative media projects ranging from a focus on science (Materia) to satire (Mongolia). To these projects, some of which are only coming fully online this fall, we can add other initiatives like Periodismo Humano, the popular cultural magazine Jotdown, and the recently launched Spanish edition of Hufftington Post. How long this organic crisis will last will ultimately depend on the resilience of the Spanish people and their mental, physical, and economic resources. In Gramsci’s time, the main obstacles preventing the birth of the new were violent repression and propaganda of the ruling classes. In Spain today—a country without the fascism of Gramsci’s Italy or the neo-Nazism of Greece today—the biggest obstacles are attacks from the right-wing media and the power of banks and corporations to cut off financing for alternative projects, as happened in the case of Público. In Spain, the old may not be dead yet, but the new is being born. Jorge Gaupp holds a BA in Political Science from the Universidad Complutense de Madrid (UCM), an MA in International Development from the Instituto Complutense de Estudios Internacionales (ICEI) y an MA in Secondary Education from the UCM. He currently works at Oberlin College, OH. Great article Jorge! It’s a concise summary of the different actions people are taking, and much easier to read than Rebelaos, which, i have to say i never managed to finish reading. I’m also a secondary school teacher/International Develpment student/activist/journalist! hahaha really close background! Thank you Anna, I’ll definitely take a look at your blog.